This is the only place you can find out this much info on Trey & Matt! Trey & Matt in "BASEketball"
'Where's the movie?" says Parker "The response was so positive, we decided we'd do it"
Together with fellow students Matt Stone, Jason McHugh and Ian Hardin (average age 23) they formed the Avenging Conscience Inc production company and raised $75,000 from private investors, friends and family by the day they needed to start shooting. They employed fellow students as cast members and took parts in the film themselves each stepping into each others shoes behind the camera when necessary. From conception to being in the can the film took around twelve months. Alferd Packer: The Musical has had a fantastic reception at festivals and screening both sides of the Atalantic with favourable comparisons being drawn between Mel Brooks, the Monty Python team and horromeister George A. Romero. The Avenging Conscience Inc are now working on several new projects, including a feature film about a sexual superhero and a comedy series for TV. 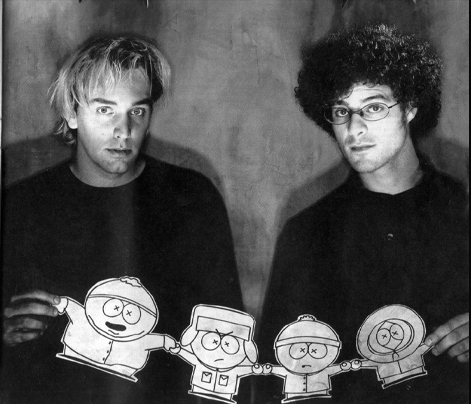 "American History" was Trey Parker's first animated film. Made in 1992 while still attending CU Boulder, the film won many awards including, believe it or not, a Student Academy Award Silver medal in 1993. The thrill of the "Battle of The Alamo"
You've been the person to check out Trey Parker and Matt Stone!